The Sierra Wave 14-Watt Power Hub is a AA battery charger and power distribution center that gets it's energy by using any of the six included chargers or from a 5 watt or more Sierra Wave solar collector. 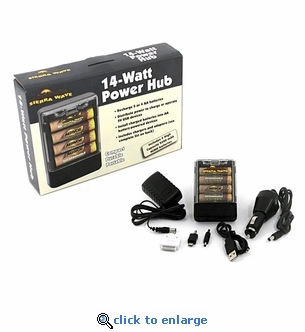 Power is stored in the 4 high capacity AA rechargeable batteries and provides up to 12.5 watt hours of power. Once the batteries are charged they can be used in any electronic device that accepts AA batteries or the Power Hub itself may be used to discharge power into handheld electronic devices. Use the 14-Watt power hub to charge or operate cell phones, smart phones, digital cameras, music players, eReaders, tablet computers, GPS, gaming devices, Wind 'N Go/SolaDyne flashlights, lanterns and emergency radios. Charged batteries can be used in AA battery-powered devices.